Majlis Speaker Ali Larijani said on Saturday that the G5+1 should adopt rational stands in dealing with Iran. 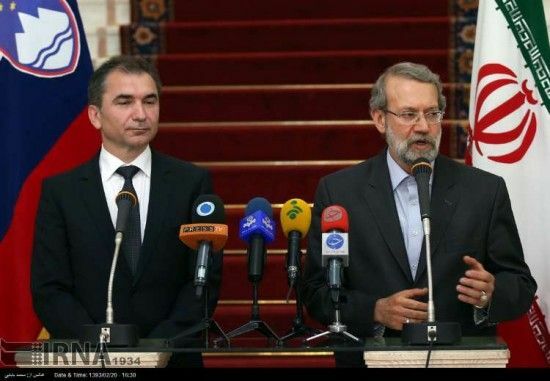 Larijani made the remarks in a meeting with his Slovenian counterpart Yanku Webber. The Islamic Republic of Iran is ready to broaden economic cooperation with Europe and transfer its gas to that region including Slovenia, he said. Referring to existing good relations between the two countries, Larijani said Iran is very positive about expansion of political, economic and parliamentary relations and cooperation with Slovenia and the grounds are prepared to achieve such a goal. Referring to huge economic potentials of both countries, he said there is no barrier to expansion of industrial and commercial cooperation between the two sides. He called for more active role of the two sidesˈ private sectors in broadening the level of mutual cooperation. Talks between Iran and G5+1 have provided a suitable opportunity for the European states, Larijani said adding that adopting rational stands by G5+1 would lead to expansion of economic and commercial relations between the two sides. The Slovenian parliament speaker, for his part described Iran as a secure and stable country in the region and said Iran and Slovenia are now regarded as two stable countries in central Europe and the Middle East regions. Expansion of economic cooperation between Iran and Slovenia would lead to expansion of political and economic relations between the two countries, he said. The Slovenian government and parliament are determined to broaden cooperation with Iran in energy and information technology fields, he said. Exchange of visits between the two sidesˈ officials and businessmen would lead to promotion of cooperation in other sectors, he said.